If you are looking for a warm and friendly dental office that can accommodate your busy schedule, you’ve found the right place. Whether you’ve lost a filling, broken a tooth or need a tooth extraction, we can help. We offer early morning, lunchtime and later afternoon appointments that fit your busy schedule. We provide our patients with same-day emergency dental care that will quickly relieve any pain or discomfort that you may be experiencing. At Morse Family Dentistry, you can relax knowing that our experienced dentist and office staff will carefully explain all of your dental care options with you before making the decision to remove your tooth. We understand that the process of having a tooth extracted can be a cause for alarm. 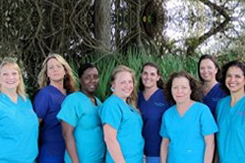 If a dental extraction in St. Augustine becomes necessary, you'll receive the nurturing care that comes with any dental procedure you'll receive at our office. Before teeth are extracted, our experienced staff will apply a local anesthetic to numb the area. During a tooth extraction, St. Augustine patients can expect to feel a slight pressure, but no pain. If you feel any pain, make sure to tell us immediately. After teeth extractions, St. Augustine patients usually require only a short recovery period. We will be sure to let you know what types of food or activities to avoid and for how long. Teeth extractions are gentler and easier than ever with the experience and dedication our staff provides to each and every patient! If your tooth has been damaged or broken, it may need to be removed. At Morse Family Dentistry, we can help! To prevent any infection or additional dental problems, a tooth extraction in St. Augustine needs to be performed quickly. We specialize in providing fast, emergency dental care for these types of dental issues. Contact us for gentle dental care with a personal touch! Teeth extractions may be necessary in order to maintain your dental health. Call our office at 904-323-4809 today to learn more or to schedule your appointment today! Enjoy gentle dental care at Morse Family Dentistry. Discover pain-free teeth extractions at our dental office. Contact us to learn more! We proudly serve St. Augustine, St. Augustine Beach, Vilano Beach, Palm Coast, Hastings, and World Golf Village.